This is from some weeks ago when I had a bit of a hangover. 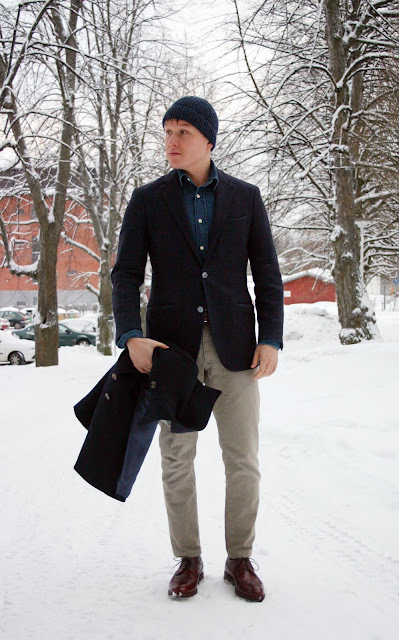 To match the mood I went for a rather casual and comfortable look with a casual navy jacket with a denim shirt. I also opted for no pocket square, probably the first time for a very long time. 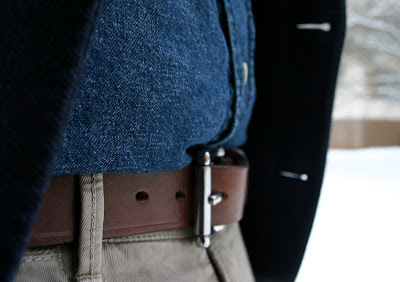 The denim shirt is from NN07, the belt from Equus Leather, chinos from Incotex, socks from Falke and shoes from Meermin. The wool hat from Norse Projects and from Nollakolme Tampere. The denim is quite heavy, and this is by no means a shirt for any warm summer days. 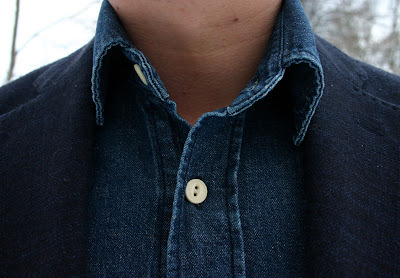 I had been looking for a denim shirt without ridicilously small collars for quite some time, and when I spotted this one at Mr Porter's winter sale I decided to go for it. No regrets so far. The denim, the chunky Equus Leather bridle leather belt and the rough Incotex Red cotton twill. Really like how it all works together. And my Meermin longwings. They've been in very heavy use and so far have only gained in character. Where is that sport coat from? This one is from SuitSupply, an unstructured wool/cotton blend in the Copenhagen fit. 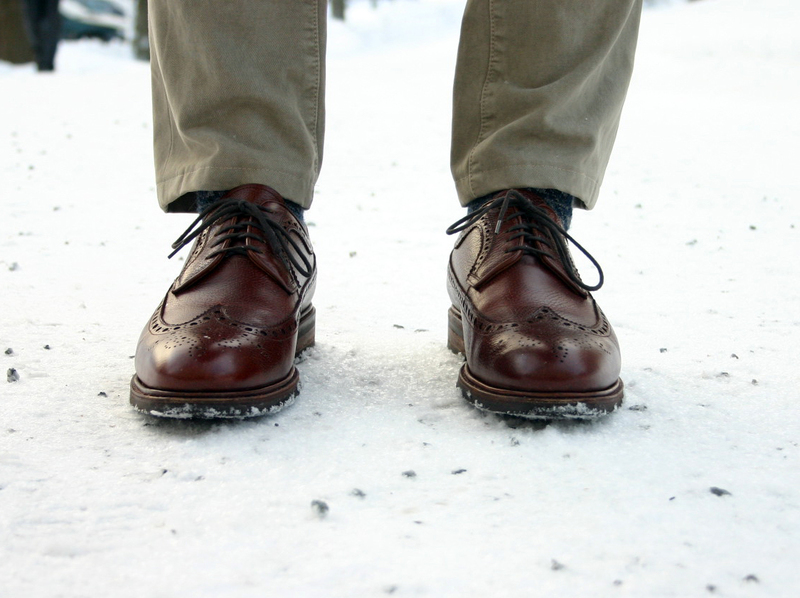 Ive noticed the snow in most of your photos with your nice dress shoes. Do you have shoes/boots you prefer to wear in the winter due to road conditions that may ruin your nicer dress shoes? In my current style I prefer to use the sort of semi casual (to match the outfit) and semi heavy (to match the season) shoes such as the Meermin longwing derbies above. I tend to rotate between them, suede chukka boots, split toe derbies and double monk shoes. All have a Dainite sole which is really perfect for the wintery conditions of the north. When wearing a suit (not very often atm) I do use more formal oxford shoes (such as C&J Hallams). For those occasions I've had a thin rubber insert attached to some of my oxfords, so they can cope in most weather.